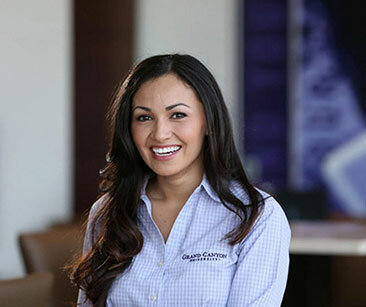 At Grand Canyon University, we offer rewarding opportunities for faculty to teach full or part-time at our Phoenix campus or remotely via our online platform. As a private, faith-based institution, we integrate a Christian worldview into our curriculum and we are excited to grow our faculty team with individuals who support incorporating that philosophy into their careers. Our broad program offerings lead to a variety of exciting teaching opportunities that are available for passionate and committed teaching staff. GCU offers full-time faculty positions for teaching our traditional student body at our vibrant main campus in Phoenix or at our campus extension locations around the Valley. We offer modern facilities with smaller classroom sizes, so our faculty can spend more time doing what they do best—educating students to better prepare them for a successful professional and spiritual path. Our faculty and management teams are filled with supportive, caring individuals who are all dedicated to providing the best in education within the context of our Christian worldview. Our online instruction team has opportunities available for full-time online faculty members who teach year-round from our Phoenix administrative location. These positions provide students with the ability to learn from their own location via our online modality. GCU hires adjunct faculty to teach courses on a class-by-class basis at both our main campus and campus extension locations as well as online/remote. Campus-based adjuncts typically provide face-to-face instruction for traditional semester-long courses. Online adjuncts teach five to eight-week long courses on a virtual basis through an easy-to-manage online platform, allowing flexibility to work during the hours most convenient for the instructor. In addition to instructor positions, we have other part-time opportunities available throughout the country for faculty to serve in roles including doctoral dissertation chairs, doctoral methodologists, subject matter experts, faculty mentors and student supervisors. Interested in faculty and adjunct positions with GCU, but can't find a position that's right for you? Submit your resume to our Faculty Jobs Talent Community to be considered for future opportunities that may align with your expertise. Currently, we are also accepting resumes for subject matter experts (SME's) for our College of Science, Engineering and Technology (CSET). Please note, by joining our Talent Community, you are not applying for a position with GCU. Rather, this is an additional way for our Talent Acquisition team to find candidates with specific credentials, if an opportunity arises. You are still encouraged to regularly check back on our career site and apply for openings that are a match for your background. Search our open jobs below to find your fit at Grand Canyon University! Not looking for Academic Positions?